You know a 529 plan is great for saving for college. But what investments will help you strike the right balance between growing your college savings, and trying to protect it from market losses? 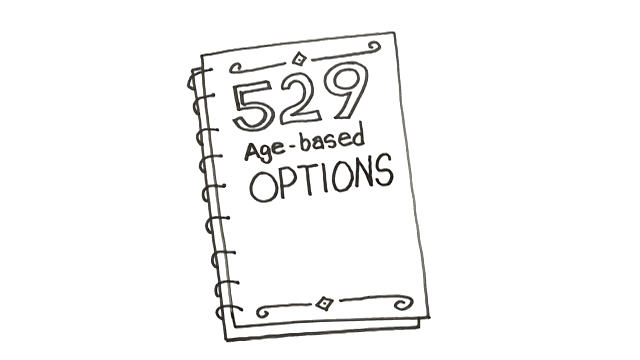 If you're curious about how 529 age-based portfolios work, this video is for you. With age-based investment options, you start by picking an option based on how risky you'd like to be with your money—conservative, aggressive, or somewhere in between. Then the account gradually moves from more stocks to more bonds as your child gets closer and closer to college. Once you've decided on whether you're aggressive, conservative, or somewhere in between, your 529 plan will invest your money based on your child's current age. So how do these portfolios work once you've opened your account? Let's take a look using the moderate age-based option. You have a child who's 3. So your 529 investment starts here—having more stocks than bonds. Then, when your child turns 6, you move to a portfolio with a little more in bonds. Your allocation gets even more conservative at 11, and again at 16. By the time your child's in college, your portfolio is all cash and bonds, decreasing the risk of losing your college money. What's the benefit to all this moving around? Well, when your child is young, you have more time to make up any potential market losses caused by riskier stock investments. Your main focus is earning returns on your investments so you have enough money to cover those college costs. But as your child gets closer to college, you shift into preservation mode—your main goal is to reduce the possibility of a loss in your account. And the rebalancing happens automatically, giving you one less thing to worry about. It's that simple! Complete portfolio in one investment. As conservative or aggressive as you want it to be. Automatically moves to more conservative investments as your child gets older. Consider choosing one to help you reach your college savings goals. If you are not a Missouri taxpayer, consider before investing whether your or the designated beneficiary's home state offers any state tax or other benefits that are only available for investments in such state's qualified tuition program. The Missouri Higher Education Savings Program (the "Program Trust") is a trust created by the State of Missouri. When you invest in MOST—Missouri's 529 College Savings Plan (the "Plan"), you are purchasing portfolio units issued by the Program Trust. Portfolio units are municipal securities. The Plan has been implemented and is administered by the Missouri Higher Education Savings Program Board (the "Board"). Ascensus Broker Dealer Services, Inc., and Ascensus Investment Advisors, LLC, serve as the Program Manager and Recordkeeping and Servicing Agent, respectively, with overall responsibility for the day-to-day operations. The Vanguard Group, Inc., serves as Investment Manager for the Plan. Vanguard Marketing Corporation, an affiliate of The Vanguard Group, Inc., markets and distributes the Plan. The Plan's portfolios, although they invest in mutual funds, are not mutual funds. Upromise and the Upromise logo are registered service marks of Upromise, Inc. Vanguard and the ship logo are trademarks of The Vanguard Group, Inc. Ugift is a registered service mark of Ascensus Broker Dealer Services, Inc.
© 2015 State of Missouri.